Goalkeeper Matt Gould - the son of former Celtic number one Jonathan - has been handed a one-year contract after a successful trial with Livingston. 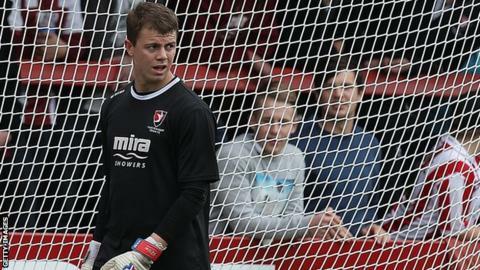 The 21-year-old was released after a year with Cheltenham Town as they were relegated from England's League Two. Livingston manager Mark Burchill was a team-mate of his father at Celtic Park and was impressed by his attitude. "He has shown an unbelievable attitude in wanting to prove himself good enough for us," he told Livingston's website. Englishman Gould has been signed primarily as back-up to 24-year-old Darren Jamieson. However, Burchill added: "Matt has trained with us for the last three-four weeks and has the ability and personality needed to push Darren for the number one spot." Gould began his career with Hawke's Bay United, the New Zealand top-flight club where his father was player and manager, before moving on to Maycenvale United in the Central Premier League. After a return to Hawke's Bay, he moved to Cheltenham last summer but did not make a first-team appearance and had a spell with Bishop's Cleeve, who were relegated from the Southern League Division One South & West.